Sunday the 21st of February...The day we'd been waiting for since we started making the film 6 months earlier. All the hard work was done and the film was sent off to Tropfest just 1 day before the deadline. Next thing we knew we were short listed, down to the top 60, and things started getting exciting. We nervously waited for the next week until we finally got the call. We were in! Baboons was going to play in the biggest short film festival in the world. We packed out bags and headed off to Sydney for the most incredible experience of our lives. Jump forward to Sunday night. Sitting anxiously in the VIP tent at Tropfest, uncharacteristically turning down the free drinks that kept being offered to us. 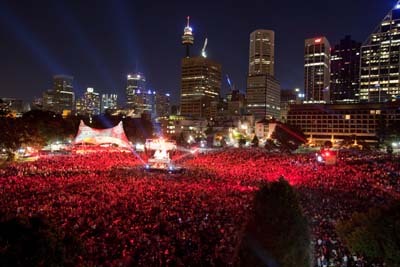 We'd been watching 75,000 people slowly pile in the domain over the course of the day. What were they going to think of our film? What were the celebrity judges going to think of our film? All of our nerves instantly disappeared once our film started to play. The crowd was loving it! We cannot describe how great a feeling it is to sit amongst that many people, all laughing and cheering for our film. 6 months of hard work was all worthwhile just for those 4 minutes. We were already winners. It didn't matter what the judges thought. To have our film shown to that many people is the greatest reward any filmmaker can hope for. Suddenly feeling a whole lot better, we sat back and watched the remaining 8 films out of the 16 and marvelled at what a unique event we were a part of. The films this year were an amazing standard. We felt very privileged just to be amongst them. Then came the awards. First up was the award for Best Original Score. Very deservedly, it went to the group of people we owe this whole experience to, The Dairy Brothers! 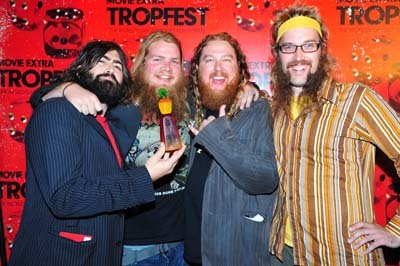 I bet they never expected their song to be winning film awards. Chaos ensued as only 2 of the band members were allowed through security. Joel Mcmillian and Tom Bettany arrived on stage and gave the best impromptu half-drunken speech I have ever heard. Something along the lines of, "We always thought it was a pretty good song...and now we know!" Josh (J-Wah) Fielder and Mike (Vibro) Bidstrup finally fought off the guards and managed to jump onto the stage, just as they were trying to move on to the next award. J-Wah, although disappointed he wasn't able to give his lengthy prepared speech, proceeded to dance and hug everybody. Soon the whole band was involved, and the crowd was loving it. Those guys sure know how to celebrate. There were a few other awards given out before we got to the one we were waiting for...Best Animation. There were 3 other films we were competing against, but the styles were all so different it was impossible to compare. Anyway, we thought we were a pretty good chance. The judges thought otherwise and gave the award to our new buddies Sheldon and Igor from BigFish. So that was it we thought. Elijah Wood and the rest of the judges must not have thought too much of Baboons. Not so. 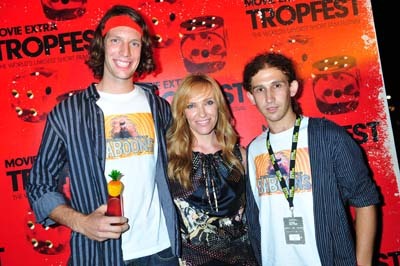 We could tell from the moment Toni Collette opened the envelope, gave a subtle smirk and took a deep breath (because she had to read out a very lengthy title), that she was going to say "My Neighbourhood has been overrun by Baboons". 2nd place! We couldn't believe it. Jumping up out of our chairs, we ran up on the stage, giving the crowd high fives on the way like we were some kind of rock stars. The next few minutes were a blur until we watched the replay a week later and realised we didn't make complete asses of ourselves on stage...just had ridiculously big grins. The celebrations continued well into the night and perhaps will continue for months to come. As we came home from Sydney, we each said to one another "Lets do that again". Now we just need to make another film.